half-geek.net - Half the "Geek Squad" price! Fixing and building computers for half the Geek Squad price! "You know - Just half of what the 'other geeks' charge!" If you feel your present computer service is too expensive, maybe it's not because they cost too much. Maybe it's because you're not getting value for your money! Services you need - services I can provide. Viruses: Getting rid of them with ZERO DATA LOSS - $50.00-$100.00. Killing the problem, NOT the computer: Call any reputable, local computer repair shop like Best Buy (Geek Squad) or Sandia Computers, and they will tell you the only way to really get rid of a virus is to "wipe the hard drive" and "reinstall the Operating System." The fee for this service is upward of $200.00. If you mention "data recovery" or "no data loss," that number might double or triple! What they might not tell you is that wiping the hard drive guarantees you lose EVERYTHING; all your pictures, music, programs, user settings and on and on. If they tell you that this is the only way to TRULY rid your computer of viruses, I say, "Poppycock!" I have a 100% success ridding Windows XP Pro and Home of all viruses with ZERO DATA LOSS. I have 100% customer satisfaction. Give me a call and let me fix your computer THE RIGHT WAY. Wireless networks: This breaks down into two categories; Security and convenience. Security: So you're surfing the web...woohoo! Are your neighbors surfing the web on your dime? Are intruders able to get to your P.C. through your wireless network? If you just plugged in your wireless modem or router and then started surfing the web, then the answer is most assuredly, "YES!" Some people feel that they are safe because they've enabled WEP encryption. Not only does this slow down your surfing speed, but it also lures you into a false sense of security. WEP encryption was broken years ago. There's a new encryption algorithm called, "WPA." But again, this only secures the data being transferred between your laptop and the web. It does not stop people from using your network or accessing your computer. For explaining this security leak in layman's terms, I use the Navajo Code Talkers of WWII as an analogy. The code talkers made sure the Japanese could not understand any given transmitted message. The Japanese could still HEAR the message - they just couldn't understand it. The Japanese still had the opportunity to crack the code, they were just unable to. Navajo Code Talkers did not prevent Japanese soldiers from boarding a ship (your network - your computer), they just facilitated communication privacy. What I do is set up your wireless network so that nobody but you (or those you give permission to) can "board" your network. The analogy I use to explain this is a finger print reader like the ones you've seen on T.V. Imagine the ship (your wireless network) has a finger print reader/identifier that won't even allow a given person to board your ship unless they have a "white listed" finger print. Now you no longer need the code talkers, because the enemy can't even see your signal, let alone try to decode it. The best part is, MY security measures have NO overhead. Just like the code talkers added extra steps or "overhead" to secure a message, WPA encryption adds the same overhead. You type the message, WPA encrypts it at your end, then decrypts it at the other end, and then relays the decrypted message. All this encrypting and decrypting takes time, which robs performance from your wireless network. My security measures won't slow down your network. Like the finger print analogy, your "finger print" is checked at the door so you're free to talk without the bog of coding and decoding. When I'm done with your wireless network, "War drivers" won't even be able to SEE your network, let alone hack into it. This doesn't mean that an FBI hacking team with an unlimited budget won't be able to hack into your network. However it does mean that your wireless network will be the most secure one in the neighborhood. War Drivers and hackers will move on to the next network and leave yours alone. Convenience: It's not uncommon for customers to discover that setting up a wireless network isn't as "idiot-proof" as the manufacturers would have you believe. Though it is possible, with almost no effort, to plug in your wireless router and surf the web via your laptop, there are many other bells-n-whistles you can use and enjoy! Like file sharing (so you can back up your files on TWO computers - ALWAYS a good idea), print sharing (so you can print wirelessly from your laptop). I can unlock the potential of your network. Not only will you be able to back up (share) files, but you will be able to print wirelessly - no matter how many computers you have. I recently spent 4 hours at a customer's house troubleshooting, repairing and configuring his wireless network. A previous "service" had installed his network using WEP encryption. The customer had 6 laptops (including a Mac) and one desktop P.C. in his network. His network was slow and communication between computers was "sketchy." He could print from one, but not the other. He could share files with the other, but not the one he could print from and on and on. It was a real mess. At first I tried to repair what had been done, but after about an hour I simply scrapped the entire netowrk and started from scratch. I was not satisfied until the wireless network was fast, reliable, easy-to-use and secure. The customer could print from all 6 laptops. In addition he could file share between all of them, too. When I first arrived at the customer's house I did a download and upload test to the Internet. Download bandwidth to his laptop was less than 1Mb. When I left, it was around 3Mb. Because I felt that I had spent too much time troubleshooting his network (should've just scratched the entire thing instead of trying to repair what someone else had done), I only charged the customer $100.00 for my 4 hour visit. This fee included the house call. Needless to say the customer was a very happy. I'm too honest and have too much pride to over-charge for my work. Everybody's computer is fairly fast when you first purchase it. Otherwise you wouldn't buy it, right? But then a couple months or years down the road your computer starts to slow down. They take longer to boot up and longer to shut down, and sometimes become so slow during operation they become unbearable to work on. Not only can I make your computer faster, but I take steps to make sure it STAYS running faster. Don't be fooled by websites or spam that promise a faster computer just by clicking the button. Most of the time its those websites that CAUSE your computer to run slowly. Those websites actually load little spy programs into your computer that download other programs and share your computer or informaton with the entire world. Nobody wants that. If your computer is unbearably slow to the point you're ready to scrap it and purchase another one, give me a call. I'll fix 'er right up. 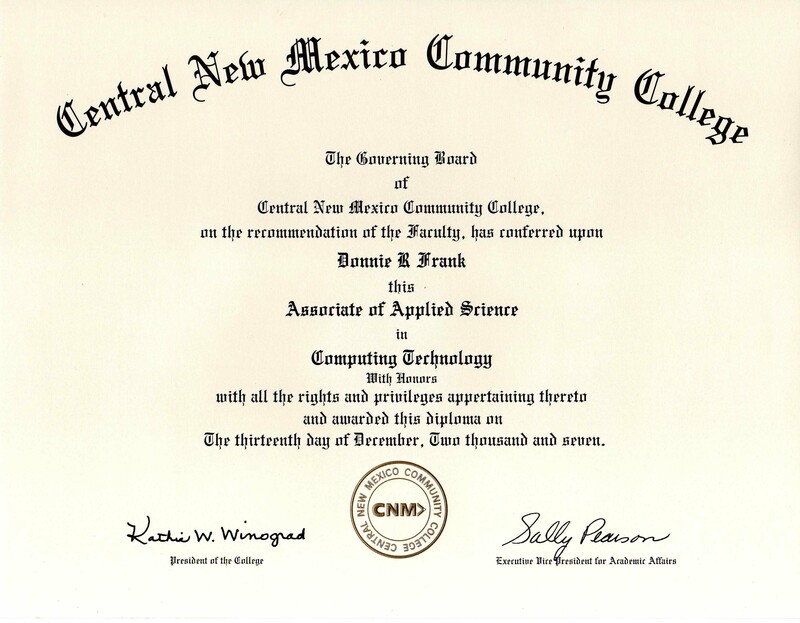 You don't pay for my education: Though I have been building and fixing computers for over 15 years (built my first DX-486 in 1992), there are still things about computers I don't understand. Anyone who claims to understand all there is to know about computers is lying to you. Consequently, if I encounter a problem I have never seen before, it may take some time to research this problem. I may be stumped once in a while, but I always find a solution to any given problem because I'm tenacious. I don't give up unless the solution is cost-prohibative (which does occasionally happen). Being a mechanically-inclined person, it is in my nature to spend hours and hours of my own time fixing problems that most guys would give up on in a few minutes. It's a sickness, I know. The end result is a greater understanding of whatever it is I'm working on. Computers are no exception. I can usually find an answer to any given problem in a few minutes. However sometimes finding a solution can take over an hour or even two! If I feel I'm spending too much of YOUR time on a given problem, you will not be charged for this time. I recently spent 4 hours at a customer's house troubleshooting, repairing and configuring his wireless network. I was not satisfied until the wireless network was fast, reliable, easy-to-use and secure. A lot of that time was spent troubleshooting firewall issues (firewall software I had never seen before in 4 of his 6 networked computers). Because I felt that I had spent a good percentage of the time "learning," I only charged the customer $100.00 for my 4 hour visit. This fee included the house call. Needless to say the customer was a very happy. I'm too honest and have too much pride to over-charge for my work. Hardware upgrades: Call up Best Buy and ask the Geek Squad what they charge to install a new hard drive or more memory or a graphics card or whatever hardware you need installed. I will do the same work for half the price. Computer repair: Best Buy doesn't really have an hourly rate. They tend to hard bid repairs. For example, if you're getting what's commonly referred to as "The Blue Screen of Death," Best Buy charges $200.00 for "advanced diagnostics and repair." Which basically means that Skippy either runs a diagnostic program which repairs the problem, or he reinstalls the Operating System, which destroys data. If additional hardware is needed, they charge additional fees for the hardware. I've heard that they simply reload your operating system (so you lose ALL your data) and send you on your way. I will NEVER do this. I understand that "data" is the most important part of your computer. I will always ask before doing something that will destroy data. And of course I will always try to recover data first. As best as I can determine, the "Geek Sqaud" charges anywhere from $50.00 - $200.00 an hour to fix your computer. This averages out to about $125.00 per hour. That said, I charge $40.00 per hour, which is less than 1/3 the rate of the Geek Squad. Repairs and/or upgrades are usually under an hour. House calls (if all goes well): The Geek Squad charges $30.00 jsut to visit your house. This does not include any service. I charge $20.00 to come out to your house, look at your computer, assess your issues and give you an estmate. If I can start working right away, I'll start the clock at $40.00 an hour. If I can't start working right away or we find that your computer is not worth repairing, I'll only charge $20.00 for the trip out to your house. Cheap enough? What if you have to take my computer away in order to fix it? Then you will be charged for the first house call + whatever time it takes to repair your computer. I will give you the option to pick your new/fixed computer up, or I can deliver it back to your house for an additional $20.00. This way you can either save money or save time. The choice is yours. Remember that repairs don't usually take longer than an hour. Some repairs require downloading software from the Internet. If you have a dialup connection it may be more cost-effective for me to download files from my house. If for some reason I can't gain Internet access from your house, then I may have to take your computer to my house to fix it. My turn-around time is usually pretty quick - usually less than 24 hours. However my schedule is pretty dynamic. If I can't guarantee a quick turn-around time, I will let you know before hand. If I have to order parts, then of course turn-around time will be governed by how long it takes new parts to arrive. What if my computer is beyond repair or not worth fixing? Then you'll only be charged for my $20.00 visit. Knowing or not whether a computer is worth repairing depends on how old it is and/or what you need it to do with it. Older computers can work quite well for surfing the web and doing some simple word processing. However if you're intending to play games or do video editing, an older system just won't due. I can sometimes determine if your computer is worth fixing or can be fixed by talking to you over the phone. 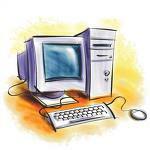 Generally speaking, if your computer is older than 5 years old, it may not be worth repairing. If it's closer to 10 years old, it's probably not worth repairing. I will do my best to determine if your computer is worth repairing via our phone conversation. If we determine over the phone that your computer is not worth fixing, you will be charged nothing. However if I have to come out to your house to ascertain this information, then you will be charged $20.00 for the visit. Can you repair laptop computers? That depends. I can repair most software issues and some hardware issues. The problem with laptop computers is, though they all follow some common construction guidelines, for the most part, they're all different. So working on a Compaq is different from a Dell which differs from an HP and so on. To make things worse, these companies change architecture from model to model. This makes it nearly impossible for the "shadetree mechanic" to fix these beasts. I actually have a Dell Inpiron 8200 laptop that has a temperature sensor issue. I've thought long and hard about fixing it myself, but will probably send it to Dell. The repair is going to be a bit spendy; in the 200-300 dollar range. I've been wrestling with the idea of sending it in. It still works, but the fan runs full blast all the time...very vexing. In most cases I can do minor upgrades like change out hardrives and/or upgrade memory. I can confidently upgrade laptop memory. And depending on the laptop, I can usually change out hardrives with a good amount of confidence. If I have any reservations about working on your laptop, I won't do it. You will be charged nothing, of course. I have repaired laptops for friends when they were willing to write off the laptop. In other words, if you have gotten your use out of it, but think there's a chance you might want to continue using it as long as the repair is under $100.00, but don't care if the computer gets killed, then I can probably help you. As stated earlier, software issues are not a problem. Can you repair my computer over the phone? Sometimes I can! The caveat is you MUST be computer literate. If you don't know what an "icon" is, what a "pulldown menu" is, or what a "desktop" is, then it's probably best that you just bring the computer to me. However if you are computer literate, know what the "command line" is and how to use it, and are confident in your ability to navigate through the Operating System, then there's a good chance I can help you via a phone call. If you have no idea what that last sentence means, then you should probably just bring your computer to me. If I can help you over the phone in under 1/2 hour, we'll discuss a small fee from $5.00 - $20.00, depending on the length of the call. You can pay me via Paypal or send a check via snail mail. If, after a repair, you run into other issues, I'm pretty good about providing free phone tech support. The caveat is that you must be computer literate enough to understand my instructions (see "Before you call me..." section below). If I have to come out to your house, you will be charged a small service fee. If I can fix the problem in a few minutes, my fee will be $20.00. You will find that I'm very fair about what I charge. If the new issue was caused or has something to do with my initial repair, you will be charged nothing. If the new issue has nothing to do with my initial repair, you will be charged a fee for the subsequent repair. I recently had a customer with a very slow computer. Her problem was mostly software related. With wreckless abandon, her kids had downloaded and installed tons of software, including 44 viruses. It was a mess. Deleting programs and battling viruses took days to fix. Once repaired and tested at my house, I delivered the computer back to the customer. Upon turning on the system, we encountered a "No NVRAM" error. Long story short, the entire motherboard needed to be replaced because the bad CMOS chip was no longer available. Since the motherboard was 7 years old, it was a no-brainer that it was just time for the motherboard to die. Granted: moving the computer may have aggrivated the problem. However this is a clear-cut case where one repair has nothing to do with another. Removing viruses and uninstalling programs does not break a motherboard. Because she was a previous customer, I charged her a very fair price for replacing the motherboard ($100.00, which included parts). She was very happy with my fee and continues to be a customer to this day. The difference between Best Buy and myself is I don't keep you in the dark. If you're interested, I'll educate you every step of the way. I have nothing to hide, therefore I don't mind explaining what I'm doing. Even if I've repaired the computer at my house, I can still offer some education which will probably save you money in the future. I find that most customers are pretty eager to learn. If I suspect future problems, I tell the customer. If those problems can be fixed by them, I tell them how before I leave. If you are not interested in knowing more about your computer, that's fine, too. I'll simply conduct my repairs and be on my way. Before you call me, do this! The first question I'm going to ask you is, "So what is your computer doing?" Be prepared to answer this question. Try to make the problem occur a couple times if you can. Take notes of any messages that you are given. Some messages can be a couple paragraphs long. Just give me the highlights. If you have no information for me, then I can't help you. One can be computer illiterate and still take notes. Help me help you. Together we'll get the issue solved quicker, which will ultimately save you money. This page is up as of September 9, 2007 - 5:19 PM and was last updated December 7, 2007 - 11:17 AM.